The Ohio Governor’s race continues to look like it will beone of the closest statewide contests in the country in 2018. CLICK HERE to read more about Rich Cordray, the ridiculously-qualified Democratic candidate for Governor, and find out how you can help flip this seat. Republican Gov. John Kasich is term-limited from running again, so this is an open seat battle between Cordray and former Republican Senator Mike DeWine. 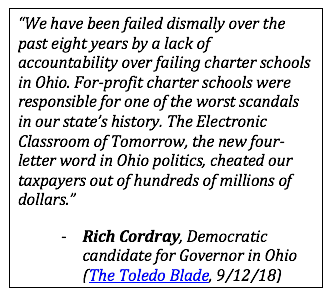 ‍One of the biggest election issues in Ohio is the ECOT (Electronic Classroom ofTomorrow) online charter school scandal – and it has a direct connection to DeWine, the current Attorney General of Ohio. DeWine argues that he had to wait for other actions by the court or state offices to step in, though critics say he could have been more aggressive. The warning signs about ECOT had been documented in news articles for many years, and yet the state government as a whole was slow to act. All told, ECOT founder Bill Lager directed more than $2.1 million in campaign contributions to Ohio Republicans who helped grease the wheels for his grift. The FBI is reportedly now investigating this potential pay-to-play relationship. The ECOT scandal has been called the largest in state history because of the hundreds of millions of taxpayer dollars that were diverted to private and political interests. ECOT finally closed its doors in 2018, but not before overbilling taxpayers more than $80 million for thousands of students who were never properly enrolled. A recent analysis from Innovation Ohio Education Fund determined that ECOT defrauded the State of Ohio by at least $189 million since 2000. …more students dropout of the Electronic Classroom or fail to finish high school within four years than at any other school in the country, according to federal data. For every100 students who graduate on time, 80 do not. …while some students may not have found success at the school, the Electronic Classroom has richly rewarded private companies affiliated with its founder, William Lager, a software executive. When students enroll in the Electronic Classroom or in other online charters, a proportion of the state money allotted for each pupil is redirected from traditional school districts to the cyber schools. At the Electronic Classroom, which Mr. Lager founded in 2000, the money has been used to help enrich for-profit companies that he leads. Those companies provide school services, including instructional materials and public relations. For example, in the2014 fiscal year, the last year for which federal tax filings were available, the school paid the companies associated with Mr.Lager nearly $23 million, or about one-fifth of the nearly $115 million in government funds it took in. Ohio will have a new Governor in January, and it can’t be DeWine – the man who accepted tens of thousands of dollars in contributions from ECOT while it ran wild under his watch as Attorney General. ‍DONATE TODAY to Rich Cordray for Ohio Governor, and CLICK HERE to find out more about how you can support other key races in the state.